The ORID technique came into my life during the first facilitation workshop I ever attended and I have found it to be an extremely useful tool. 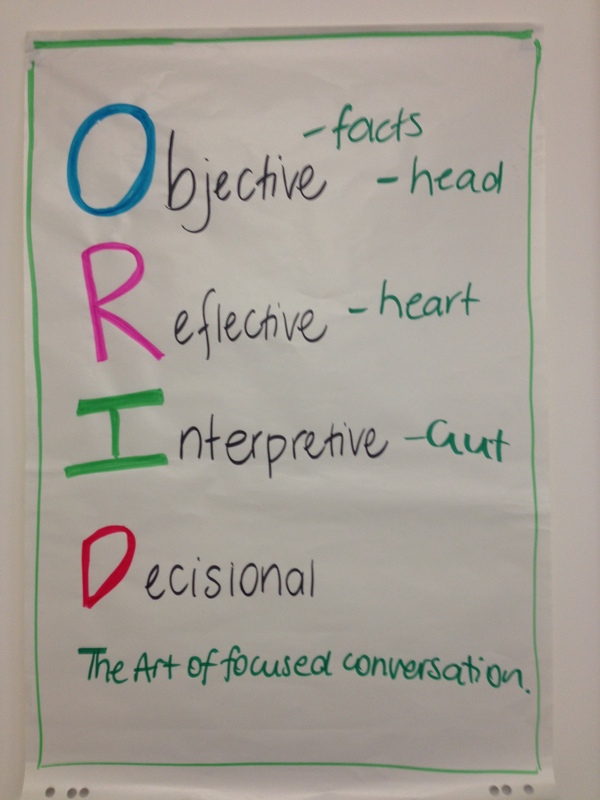 As described by R Brian Stanfield in his book, The Art of Focused Conversation, the ORID provides a framework for conversations to solve a problem, make a decision, evaluate an event, generate commitment, explore options or to build on a vision. His book provides 100 examples of using the technique in our everyday life. I find it particularly useful as a review or evaulation process and to assist with decision making. So how does it work? What are the topics we have talked about today? What is the financial position? What were the most important facts in this report? R Reflective question – this checks in with how we feel about the situation or the facts. It focuses us on the personal internal reaction. I think of it as the heart question – what emotions or feelings do we have. What surprised you in the presentation? Where have you been frustrated by the process? What’s it like to be in this situation? I Interpretive question – these questions aim to examine the meaning, the values and the significance of the topic. Interpretive questions provide the opportunity to draw out the significance of the O and the R. For me it’s the gut question – what does this mean for me? What challenges need to be resolved? What are the key messages in the workshop? What alternatives are worth considering? D Decisional question – aim to bring a resolve to the conversation, a consensus, create an action plan or steps forward. What will you differently as a result of this workshop? What kind of future situations could these learnings be applied to? It is particularly important not to overlook the impact of the reflective questions – the feeling and emotions when we are making a decision. We are comfortable dealing with logic and often go straight from facts to interpretation without dealing with the feelings as we perceive them to be more challenging to quantify. Feelings and emotion are an important part of decision making and when overlooked actions are often not followed through on or decisions are regretted later. For more information on the ORID I highly recommend Brian Stanfields, The Art of Focused Conversation – 100 Ways to Access Group Wisdom in the Workplace, (2000) published by The Canadian Institute of Cultural Affairs. My well worn copy has been a valuable facilitation and coaching resource.